At the conclusion of an assessment of the security situation, Jerusalem district police decided on Wednesday to remove several key barriers that were stationed in the eastern part of the city in an attempt to stem the wave of Arab terrorism. Police claimed the change was decided on due to "a certain achievement of security stability that allows an ease," but in at least one Arab neighborhood it was the promise of local Arab leaders that apparently caused police to abandon the security measures, reports Yedioth Aharonoth. Among the security barriers removed was one on Hamalakh Street in Abu Tur heading towards Shiloach (Silwan), another in Jabel Mukaber, one on a route from Um Lison to Barzani, and likewise a barrier in the direction of Barzani was changed from being a full "hermetic" seal to a "breathing" barrier with a checkpoint. The barriers removed join a list of security barriers already lifted, including in Wadi Joz and Sheikh Jarrah near Mount Scopus, as well as the conversion of two barriers from "hermetic" to security checkpoints in Isawiya and in Abu Tur. According to the police, the Isawiya barrier was removed after Arab residents and local Arab leadership promised to keep the quiet in the volatile neighborhood. 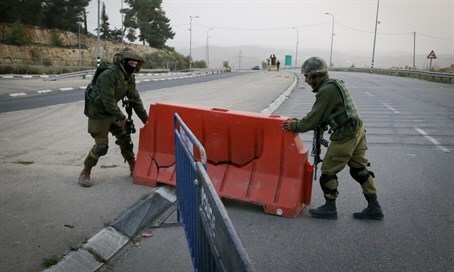 After several days without the regular incidents of rock throwing and other terrorism, the police changed the barrier at the entrance to the neighborhood into a "breathing" security checkpoint. Police sources claim that if the quiet is breached, the barrier will become "hermetic" again. No less than six Israelis have been murdered in Jerusalem terror attacks, four of them from attacks on the same day last month including a bus shooting attack in Armon Hanatziv and a car and ax attack in Geula. Another two were murdered in a stabbing in the Old City in early October. The Security Cabinet responded by considering putting the capital on lock down, but the new move indicates that the security is being eased in the city - even as the terror attacks and attempts continue. Just this Monday a 45-year-old female tour guide was attacked by an Arab terrorist as she led a tour group at the Old City's Yafo Gate. The terrorist hit her over the head with a glass bottle, leaving her with extensive head wounds. Then on Tuesday, an indictment was submitted against two Arab terrorists, one a 15-year-old and the other a 17-year-old, who a week earlier bought an ax and knife and sat near Yafo Gate waiting to stab Jewish victims. The two were arrested before they could launch their attack.